â¢ Information is now a social asset and should be made public, for anyone to link, organize, and make more valuable. â¢ There's no such thing as "too much" information. More information gives people the hooks to find what they need. 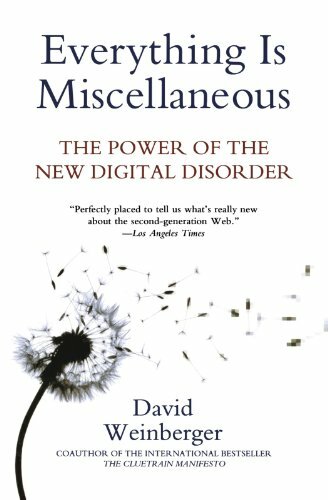 â¢ Messiness is a digital virtue, leading to new ideas, efficiency, and social knowledge. â¢ Authorities are less important than buddies. Rather than relying on businesses or reviews for product information, customers trust people like themselves. With the shift to digital music standing as the model for the future in virtually every industry, Everything Is Miscellaneous shows how anyone can reap rewards from the rise of digital knowledge. About: Analyzes the implications of the digital revolution in terms of modern-day business, education, politics, science, and culture and explains how to take advantage of the new emphasis on the miscellaneous and the deluge of information. About: "Perfectly placed to tell us what's really new about [the] second-generation Web.